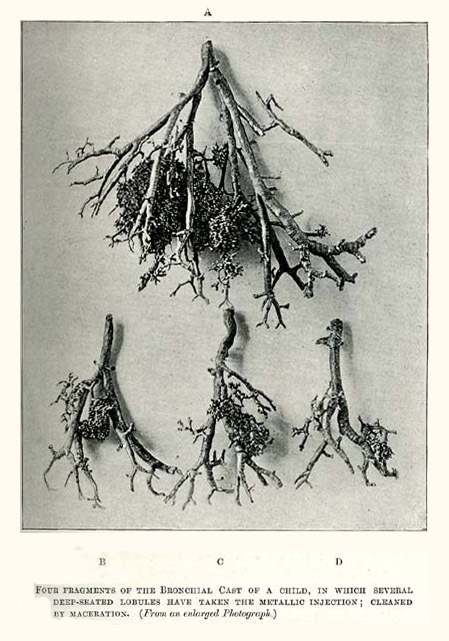 The bronchi and pulmonary blood-vessels. Their anatomy and nomenclature; with a criticism of Professor Aeby's view on the bronchial tree mammalia and of man. London : J. & A. Churchill, 1889. Description : xvi, 1 l., 232 p. ; ill.: 20 fig.s, 8 tables ; 27.7 cm. Photographs : 8 photogravures (3 l.s, 5 in-text.). Subject : Lungs — Morphology, development. Also published by: Bailliere, Tindall & Cox, (London). Author caption: "Physician to St. George's Hospital; Physician to the Belgrave Hospital for Children; Late assistant-physician and pathologist to the Brompton Hospital for Consumption and Diseases of the Chest." Provenance: Edward Delos Churchill, (1895-1972), w/bookplate. Eponym: Ewart's sign — "Pulmonary collapse at the left base in pericardial effusion" (GM 2802). I should have gladly relied upon the exclusive use of the photographic method for the sake of its automatic accuracy. But in the case of the bronchial casts, which possess considerable depth, this advantage is counterbalanced by the inability of the process to do even justice to the representations of different planes. The results obtained were so discouraging, especially in the case of the casts obtained by injecting the sets of pulmonary blood-vessels in addition to the bronchi, that the attempt had to be abandoned. The large drawings were made with great care under my own supervision. The cross lines, which appear in several of the drawings and photogravures, represent even distances, and serve the purposes of a scale of measurement. They were obtained by placing in front of the objects, when drawn or photographed, a frame, upon which fine wires had been stretched at intervals of twenty millimetres. — Pages 4-5. Called the "father of segmental anatomy," Ewart was a cutter not just of the human lung, the subject of this work, but also of Professor Aeby's monograph on the lung published in 1880. Aeby's models did not take into account differences in the contours of animal and human thoracic space in shaping the lung. Ewart's detailed flow-charts and nomenclature of the divisions and distributions of the bronchial tree were rendered from numerous corrosion casts he made by injecting specimens with Wood's metal, a eutectic flexible alloy composed of bismuth, lead, tin and cadmium with a melting point of about 150°, only a few degrees higher than beeswax.